Finally we get ample amount of rain in our bay area and its a great relief to everyone…. Last week was really easy-going, work as well as house wise, as I had to work only four days since there was a major electrical shutdown in our building on friday, and we had to take a mandatory off. We knew this before so I had asked my husband to take a day off too and we planned for a day out starting with a nice lunch at a restaurant called dish dash (Mediterranean food) the food was heavenly and we enjoyed it thoroughly followed by watching a movie in the theatre. We watched “The grand budapest hotel” which recounts the adventures of Gustave H, a legendary concierge at a famous European hotel between the wars, and Zero Moustafa, the lobby boy who becomes his most trusted friend… its a comedy drama and all the casts have played their role wonderfully…..I recommend it to all who have not watched it yet. 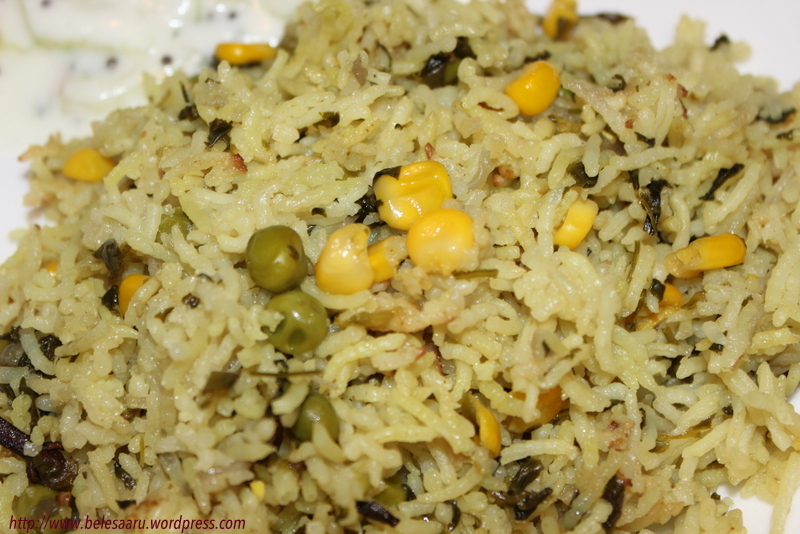 Having a relaxed friday, I was all refreshed to cook at home over the weekend and planned to make “Methi mutter corn pulao”. 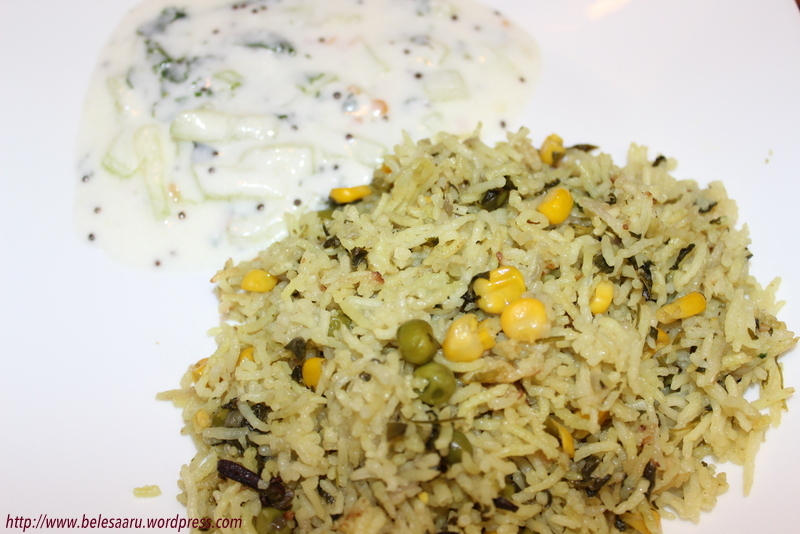 This is a very simple yet delicious recipe with flavorful spices and rice. Heat oil in a non stick pan, add pepper corns, cinnamon, cloves, cardamom and sliced onions, sauté on a medium flame for 1-2 minutes. Add turmeric powder, ginger and chilli paste and sauté for 30 seconds. 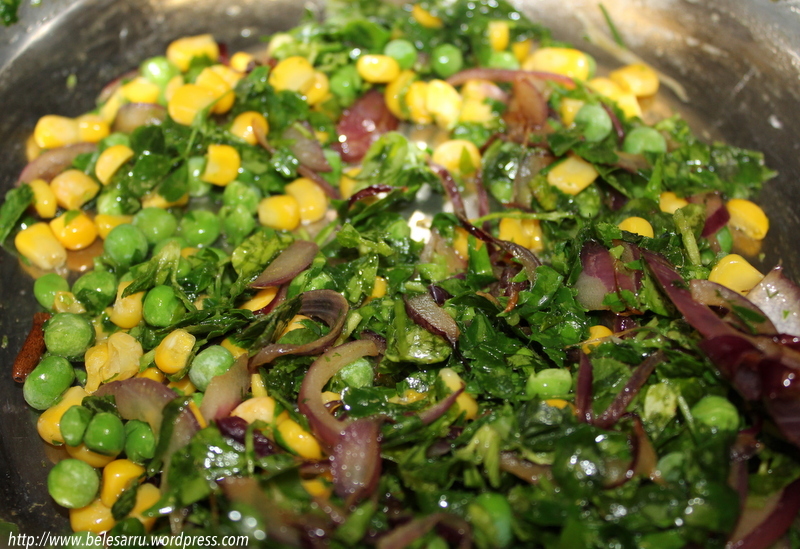 Add cooked green peas, sweet corn kernels and chopped fenugreek leaves. Sauté again for 3-4 minutes. Add 2 tbsp of water if it becomes very dry. Add salt according to your taste. Once everything is cooked. Add the cooked rice, mix well. Adjust salt to your taste and serve hot with yogurt or just plain. P.S. I soaked the rice in water for about 10 minutes then drained the water completely. I added 2 cups of water to 1 1/2 cups of rice and cooked in a rice cooker.